The bundt cake is challenging the lemon pudding cake as my sworn enemy. Back when I worked at Campagne there was one cake that I never mastered. That's not to say I always got it wrong. But I never knew if I had gotten it right until it did its time in the oven. Had I mastered it I would have been able to recognize success or failure just on the appearance of the batter. The lemon pudding cake was a very delicate cake that required a very exact temperature and combining of ingredients. I got it wrong 60% of the time, and then I had to throw the all away (they were individuals) wash the forms myself (gasp! ), and start all over. In a sign that my pastry skills are suffering from underuse, I now find myself in the position of having lost mastery of the very simple bundt cake. I have a 12-cup heavy-weight, nonstick NordicWare bundt pan that has been reliable for years. And now, nearly every other time I make a pound cake it gets stuck in there the only way to get it out is to break it up. Drives me crazy that I don't know what I'm doing wrong. Luckily, should I ever really need to be in possession of a chocolate pound cake I can turn to my well trained grasshopper. My oldest makes this cake P-E-R-F-E-C-T-L-Y. Anyhoo, I made one this morning and knew I had beat too much air in it when it quickly deflated after it was done baking. The writing was on the wall. I tried to remove it anyway, but it was solidly stuck. Very quickly we had a huge cake mess, with half the cake turned out on a plate and half still stubbornly clinging to the pan. My kids were off school today, so it was sort of perfect. The little one has been very eager to make cake balls ever since her babysitter told them what they were (she has since eaten them at Starbucks). I was not about to let all that Valrhona cocoa go to waste, so we mixed up some ganache, crumbled up the cake, and rolled up our sleeves. 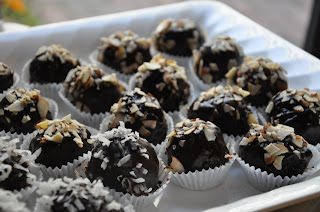 It was fun (and useful as I needed to bring a dessert to my girls' school today) but I would definitely not make cake balls again. For one, it was a huge time sink - we easily spent an hour and half mixing, forming, coating and covering those stinkers. And two, the amount of chocolate that went into this things was sort of obscene. We made 50 cake balls (the whole bundt would have make another dozen but we ran out of ganache). We used about 10 ounces of chocolate to make both the ganache and chocolate glaze. The end result: for the serious chocoholic only. They were deemed too rich for my daughter's taste. Hope the teachers liked them, as that's where they went. It was report card pickup today and parents take turns providing treats for the teachers during the conferences. If I did do it again, I would make sure to first pick up lollipop sticks, sold at Jo-Ann Fabrics or a retailer with a good baking or candy-making section. If you do choose to make them, you really must have something to cover the chocolate coating because they look too rough otherwise. Nuts looked great, as did the coconut. Ice cream sprinkles looked fab, too.